Blog | How to get a garage makeover with wooden overlays? How to get a garage makeover with wooden overlays? 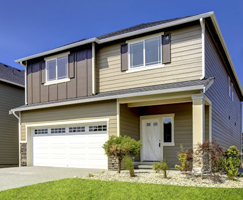 Planning to change the boring look of your garage door? Get door makeovers using the fresh trend of wooden overlays. Though your home may be worth a million bucks, the door to your garage may play spoilsport and may look very simple and conventional. There is no point in having elaborate and expensive architecture for your well designed homes and compromising on the entire look, due to old fashioned stamped metal doors for your garage. This happens because customers go for plain stamped metal overhead doors that are easy to install, traditional and come cheap when compared to high end real wood doors. Homeowners do not really think of upgrading to a classy and high end wooden door, when they are thinking of a makeover for doors of their garage. The question that comes up in most people’s mind is why spend a whole lot of money on a garage door, when you already have an existing door that is in good working condition (though it may look boring). With that said, you need to know that with the advance in technology and wide variety of choices, you no longer have to spend a lot of money on that coveted snazzy looking garage that has been your dream. It is within the reach of every home owner who has a clear idea of what they want and is equipped with a reasonable budget. Wooden overlays are a great way to makeover your boring door. Pre-cut wooden overlays are available in the market which is exclusively designed to fit easily over your existing door. Wooden overlays come in a huge range of patterns and wood types. The customers only have to pick a wood type and pattern of their choice, so that they can either custom create the design or incorporate them into pre-cut panels which safely attach to your door. Strong rare-earth magnets are used for the purpose of attaching these pre-curt wooden overlays. After assembling the panels, they cannot be distinguished from the wooden door and look every bit original. This drastic makeover can instantly increase the attractiveness and charm of your garage door and that too at a relatively low price. Many companies market wooden overlays nowadays which are aimed at changing the look of a conventional carriage house door. They can either be bought at the store or customer created through craftsmen who deal with creating wooden designs for the doors. Most of the “off the shelf” designs for doors meant for garages will be made up of metal or fiber glass. If you want a hardboard door you may have to specially order it through a lumberyard, home center of a dealer who deals with marketing such doors. Unless you do proper research on wooden doors available in your area, you may have to pay a lot of money in the process. Wooden overlays add an exquisite charm to the overall appeal of the look, which cannot be achieved by metal or fiber glass doors and this fact makes it a great choice for makeovers.